This is mostly directed at Rich in the Frontroom Press, but anybody else’s suggestions/observations would also be much appreciated. THE PROBLEM: I have acquired a C&P 8x12 New Style (the flywheel has straight spokes; I am given to understand that makes it a New Style). It came with an “hourglass” treadle however, for several reasons I won’t go into right now, the treadle isn’t workable at the moment. I have several ideas to correct the problem and make the treadle functional, but if they don’t work I want to be able to fall back on a “Plan B” and fabricate a useable treadle of wood. I’ll add at this point that I am an experienced woodworker with a well-equipped shop, but just returning to Letterpress after a very long hiatus. 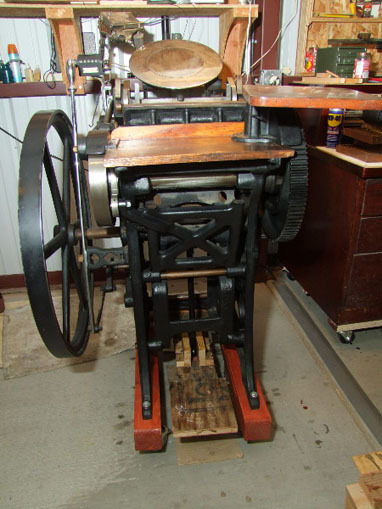 Rich, the photo of the press for which you made the wood treadle shows it very well fom the front. Would you have any photos or diagrams, or could you describe, how you did the linkage that connects the treadle hook to the treadle and how and if you connected the rear end of the treadle to what I would describe as the “bed shaft (part 96 in the reference)?” I will be most appreciative for any information you can provide. Thanks. There are several distinctive differences between New Style and Old Style presses, though of course the serial number will clearly identify it. Some parts are interchangeable, the flywheel being one of them so there’s an outside chance you have an Old Style press with a replaced New Style flywheel. If you post the serial number, which is found in the upper left hand corner of the bed, we can tell for sure. In any case, when it comes to the treadle there are differences even between Old Style presses regarding how the treadle is attached, at least as far as the 8x12 is concerned. For example, the treadle reproduction Hern sells for the 8x12 Old Style works on later model Old Style presses but not on the very early ones. I believe they used an original treadle as a pattern and that treadle was the later model. That’s why you see postings here periodically from people who have the early style press and the Hern treadle but can’t attach it. That’s not Hern’s fault, their treadle is fine but there are still some of those earlier presses out there (mine was one) and the width of the end where the treadle attaches is narrower and attached differently to the shaft. You can’t really make it work even with extensive reworking unless you take the entire frame apart and install a different shaft. New style press treadles are of course different from any of those above anyway. But I thought I should lay all of that out as some possibly useful background info. I made my treadle fancier than necessary but I wanted it to look good, be strong and last, be easy to attach and remove, not damage the press by any rubbing action, and have some ability to be adjusted in case of any wear over time. I happened to find some hickory at work but otherwise I would have chosen white oak or ash. These woods are all hard, strong, and elastic rather than brittle. Of course, frankly a 2x4 would probably have worked just as well but why not do it right, eh? At the end of the treadle that attaches to the press I joined the “braces” or “wings” are actually one piece joined to the main shaft with a half-lap joint. The shaft forms the top of the saddle and extends all the way back and the cross piece the bottom of the saddle. I cut the dado in the cross piece before I cut out the corners, which was just for decoration. It was easier to work with the piece when it was still whole. I worked from the outside in about half way and then flipped the piece around and went the other way. A wide dado like that is more troublesome but using the fence as a stop and the miter gauge with some sandpaper stuck to its face to keep the piece from slipping worked fine. The front cross piece/foot pad was also attached using a half-lap joint, for strength and to keep the thickness of the treadle the same overall. I cut away at an angle some of the front edge of the main shaft underneath that piece and also rounded down the top front half of it to allow your feet to rest on it at a less extreme angle. It also looks less clunky. I think you can see most of that in the photo. The front and rear cross pieces were glued and screwed together, the screws from underneath so they wouldn’t show. I cut some stop coves in the top edges of the main shaft and rear cross piece for decoration. To attach the treadle to the shaft I plowed (cut) a groove in the back edge of the treadle, and I do mean the edge, from back to front. The groove was the same width as the shaft thickness, actually about 1/64” larger, though this is not absolutely critical, no need to get out the micrometer. The idea is to allow the slightest amount of play so it won’t bind in use even if the wood shrinks a bit in the winter but not so much it will be sloppy and cllunk while treadling. In any case, this could be adjusted later if necessary so if you happen to cut it too big, no worries. The groove has to be about 2” deep and the shaft as I recall was about 1 1/8” diameter. Since the average dado head only goes up to about 7/8” you’ll need to, as I did, make two passes for the width, doing so multiple times, working a bit deeper each time. You don’t want to try and hog out too much at once. You’ll need a 10” diameter dado head, a 6” won’t allow you to go deep enough. Now you need a block the length of the rear of the treadle, as tall as the exact width of the groove. Note that the sides of the groove will want to cup in a bit so to get the measurement for the block you’ll want to measure the bottom of the groove. 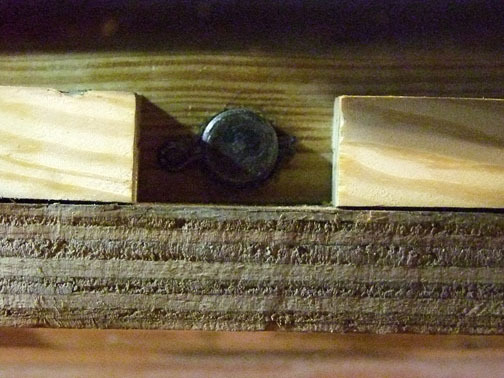 The sides of the groove will be pushed back out when you insert the block and make for a nice fit. The width of the block should be such that when the treadle is on the shaft and the block is inserted all the way into the groove about another 1/2” or so sticks out the back beyond the end of the treadle. The only purpose of it sticking out is that, because the groove can in practice be only so deep and the treadle can therefore slide only so far onto the press, if you made the retaining block so it was flush with the back of the treadle it wouldn’t be very wide and be hard to drill and grip for adjustment purposes. This retaining block is attached as follows: Once the treadle is on the press and the block is inserted all the way into the groove drill about four holes all the way through the treadle and block from left to right. Then remove the block, marking it with a knife so you will always know how to reinsert it the right way. Using the holes in the block as a guide, drill additional holes in front of and behind that first hole and clean them out to make grooves so that once assembled with the bolts, you can move the block in and out just by loosing the bolts. I inserted the bolts with the nuts up so it would be easier to get at them. While the treadle is still off the press, drill another four holes evenly spaced and 1/4” diameter on the top above where the shaft will go through for oil holes. 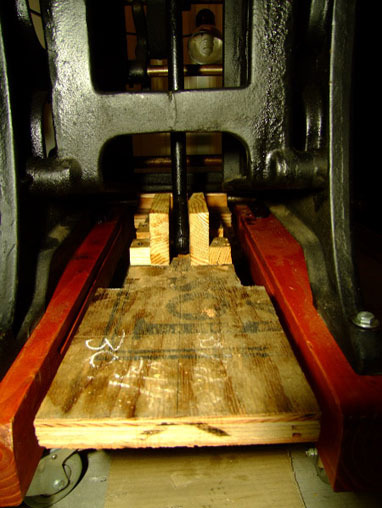 Also make sure that there is a little play left and right between the frames at the rear cross piece when it is attached to the press. As far as the treadle itself goes, that’s about it. It’s not all that much work in the end, though it sounds like it when you write it out. Again, a board attached to the shaft with some bailing wire would probably work. But it wouldn’t work nearly as well or look like it belonged with the press. Sara Smith of Smith Letterpress has my old press and I really made the treadle for her. She has been using it for a while now and it seems to work good, it’s steady and quiet. I’m sure she wouldn’t mind if you wrote her and asked about it. She may also have or could probably get more photos. You may want to ask her for dimensions. I used an original treadle that I borrowed to help with things like length and where the mortise for the treadle hook should go, but I don’t have them any more. On putting a newer style treadle on the older C&P with the thinner support: I ran into this problem with a 7” x 11” I once had. I ended up having a machinist drill a hole a little bit larger than the size of the support, through solid stock which was the width of the treadle. The support was then unbolted and slid out, the machined part slid on, and the parts reassembled. The machinist put a grease fitting in the middle of the part. It worked like a charm, and I’m sure it is still in operation today. I had to make a treadle for a 7” x 11” Prouty that I owned (the darned things snap shut so fast, I wanted more control than I would have had with a motor). I directed a machinist to again weld a pipe that would fit over the rear support of the press to a length of 4” steel U channel(with the U upside down). He milled an elongated hole for the fulcrum and holes in the side for the axle. We cut a piece of metal decking for the foot part of the treadle and welded it in position. The underside had to be tapered so the channel wouldn’t hit the floor. Then I calculated the necessary length of the hook by hanging it on the press with a cord, with the shaft in the bottom position and the treadle also in the bottom position. I gave the dimensions to a man who did wrought iron work and he made the hook to my specifications. My machinist drilled oil holes into the top of the hook and the pipe at the back. I no longer have either press unfortunately. Wood Treadle for C&P 8x12 Update. In my last posting regarding the fabrication of a wood treadle I indicated that 1.) I thought I had an Old Style with a New Style flywheel, 2.) that I would attempt to refit the treadle that came with the press after failing to make it work the first time around, 3.) that I would fiddle with adapting the J hook and 4.) I would try to contact Sarah Smith for pictures of the treadle that Rich Polinski made for her OS. I want to add some pictures to this posting that illustrate what I’m writing about, but frankly I’m having some problems extracting the images from Photoshop Elements and adding them to this comment. So I’ll probably transmit them separatley by e-mail addressed to Elizabeth and appeal to her good graces to get them into the posting, if possible. After some poking around (that’s called “research” in the academic world) on the internet, I think I really do have a New Style (its serial number is B53607) that came with a treadle designed for the Old Style (see picture, if I can figure out how to transmit it). I just can’t make it work; that being the case there was no need to fiddle with the J-hook. I got lazy about contacting Sarah Smith and instead decided to use the information that Rich and Paul provided, along with referring to the two previously posted pictures of the wood treadles that Rich sent. I couldn’t figure out from his written account precisely what Rich had done, but he gave me enough ideas to start work on a prototype replacement treadle which, while not very pretty, works quite well. I fabricated this piece entirely from whatever scrap I had in the shop, including bits and pieces of the pallet the press was attached to when shipped. 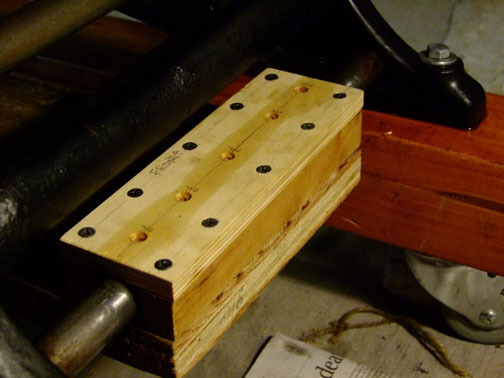 As I hope you will be able to see, there is a piece of 9-ply plywood that serves as the pedal, which is attached to a box-like structure that is fitted precisely to the press lower-rear crosspiece. I was able to utilize the J-hook by creating a bearing structure (vaguely similar to a main bearing supporting an automotive engine crankshaft) which houses the eye and connecting pin of the J-hook. This is made of something like pine, which is a pretty soft wood, so I don’t expect it to last awfully long. The design vaguely mimics the way a J-hook connects to a factory-made treadle. 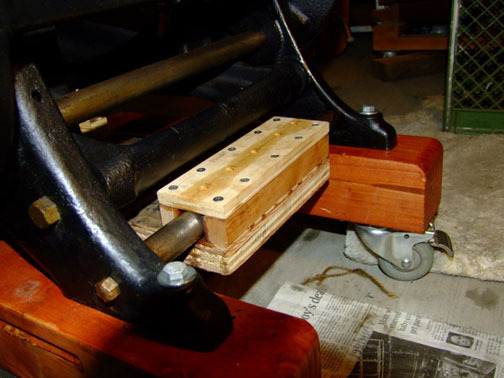 When I fabricate the finished piece I’ll probably use Lignum-vitae for the “bearing box,” as I describe the piece that connects the J-hook to the treadle. During my years associated with the maritime trade on the West Coast, I talked to ships’ engineers who told me that some main-shaft bearings on large ocean-going vessels were made of Lignum, which is a very hard and naturally oily wood. Following Rich’s recommendations, I’ll use White Oak (which has better properties for this application than the more commonly available Red Oak), for the pedal. I will also probably create at least one additional design which will utilize what is known as a “torsion box,” which, while difficult to describe, is a structure light in weight but having great strenth and allows the use of sheet goods—plywood—in its making. As I hope you will be able to see in the photos, I have mounted the press on a set of 4x4 skids that I milled for the purpose. In turn the 4x4s have heavy duty castors, rated at 250-pounds each, attached to them. I have wood blocking that I milled providing additional support underneath the 4x4s when the press is in its working position in the shop. I intend to add 4x4 cross braces onto the skids. With the baseline of the press now about 7-inches off the floor, I will be buildling a platform-riser so as to position myself at a convenient and safe height to feed the press and pump the treadle. When I feel comfortable that I have arrived at a safe, comfortable working position at the press, I will draw a finished design and fabricate what I hope will be a long-lasting and efficient treadle. I will add updates as the design process goes along. Additionally, I will contribute postings in future that describe how certain woodworking techniques can be applied to Letterpress. Many thanks to Rich and Paul for their input. RE: C&P WOOD TREADLE PICTURES: I have not, unfortunately, succeded in uploading the pictures which illustrate the prototype NS C&P treadle described in the above posting. I’ll keep working on that and ideally get them up in the next few days. Thanks for your patience. Photos of a Working Prototype Wood Replacement Treadle for a New Style C&P 8x12 are Now posted. Very nice. Thanks for posting your progress. The email you sent me directly ended up in Limbo, or possibly Purgatory, and I only found it today and sent you an answer. I also must be going blind since I have missed the last few posts here until a few minutes ago. Is the mind really the first thing to go…? Well, you definitely have a New Style press, it looks real nice. You pretty much captured the idea of connecting the treadle to the rear shaft; a variation on a theme. It puts the level of the treadle slightly lower than the original but with the press elevated like it is that won’t be a problem. 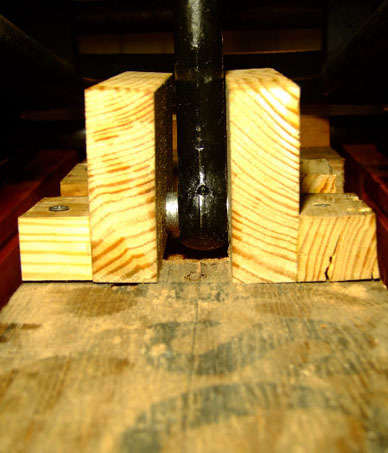 It might be a good idea to place split locking collars, store bought steel (McMaster-Carr) or home-made wood on either side of the box that goes over the shaft. Otherwise the treadle is likely to move back and forth on the shaft in use and bind up or even prevent treadling altogether as the treadle will come up against the runners. You may also want to add a buildup on the top at the end your foot will be on to keep that height in the proper relationship to the platform you’ll be standing on and to the press in general. Is there a reason why the press is blocked up so high and on casters? If you need to move it around temporarily and the floor is finished you could use PVC pipe under more averaged-sized runners instead of the usual iron pipe. It seems a little high for comfort and of course you then have to institute a series of adjustments like the platform to be able to work at it properly. A 1 1/2” thick hard wood runner should be more than adequate. All in all it’s looking good! Keep us posted. Happy 2018!! I need your expertise advise on the C&P press. I acquired a C&P since 2009 in my garage. Sometimes I feel like i need to around my press but it is such a hassle for me. I saw your post recently, I saw you had wheels on your press, do you have any recommendations what wheels I can put on my press? Look forward to hear from you!